In this episode of Sound Like, Rabea & Matt attempt to recreate the sound of alternative rock giants Smashing Pumpkins - for under £1500! The Smashing Pumpkins are icons of the American alternative rock scene. Rising to fame amongst the murky, sorrowful backdrop of Seattle-born grunge in the early 90s, the Pumpkins brought something fresh to the table with their unique, cutting-edge sound. Renowned for their huge melodic riffs and a preference for major keys, the signature sound of The Smashing Pumpkins was pioneered by frontman Billy Corgan, the band’s founding member and primary songwriter. A fastidious tone-chaser, it was on the band’s landmark second album Siamese Dream (1993) that Corgan crafted the super-thick layered fuzz tone that defined the band, with the help of his bandmate and rhythm guitarist James Iha. Despite establishing such an identifiable sonic foundation for the band, Corgan changed up their sound quite dramatically from album-to-album. This means that finding gear that encompasses the band’s diverse 10 album back catalogue would be a big challenge, especially on a budget that can’t exceed £1500! So that’s why in this episode of Sound Like, Rabea and Matt have focused on attaining the tones that listeners will be the most familiar with. Heavily indulging in the Siamese sound, the guys also touch base with songs from the band’s debut album Gish (1991) and their monstrous third, Mellon Collie and the Infinite Sadness (1995). Throughout most of his career in The Smashing Pumpkins, Billy Corgan has rarely been seen without a Fender Stratocaster in his hands. Favouring 70s hardtail models in the early days, Corgan fitted his Strats with aftermarket Lace Sensor pickups – the Red/Silver/Blue set. Able to give him much more versatility compared to typically noisy and thin-sounding single coils, this powerful Lace Sensor combination could handle potent amounts of gain without harsh feedback or brittleness. Occasionally using Gibson ES hollow-bodies from the mid-90s, Corgan’s taste in guitars became slightly more varied towards the end of the decade. He was often seen onstage with Les Paul Juniors, SGs and various Reverend models, in an effort to transform the band’s sound. When The Smashing Pumpkins reformed in 2007 after their initial breakup in 2000, Fender collaborated with Corgan to design a signature Stratocaster model. Featuring a trio of stacked, custom-designed DiMarzio pickups, this modern-sounding instrument retained many of the construction features of his old-school workhorses, with a hardtail bridge, maple neck and a vintage-esque nitrocellulose finish. Discontinued after only a couple of years, the venture between Corgan and Fender ended in 2011. However at the 2016 NAMM Show, Reverend Guitars unveiled a striking signature instrument for Corgan. It was therefore a no-brainer for Rabea and Matt to pick out this guitar! Featuring a set of Corgan’s super-hot high-output signature RailHammer pickups, the most noteworthy design quirk of this unique-looking guitar is its chambered body, covered by elegant Aluminium panels. Constructed from Korina (1), this guitar projects plenty of low-end and mid-range sizzle, with the chambered pockets (4) helping to produce rich harmonics and overtones, perfect for riffs like Cherub Rock and Quiet. A bolt-on Maple neck (5) offers all of the top-end snap you’d ever want, giving a fast response that tightens up the low-end. Its design lends itself perfectly to high-gain distortion and fuzz, with an incredibly lively and vibrant sound thanks to the Custom Humcutter pickups (2). But it’s not a one-trick pony, as the guitar also cleans up very well for the more mellow tunes in the band’s repertoire, as Rabea demonstrated in the 1979 excerpt. Essential master volume and tone controls are featured, but like most Reverend models, the Corgan signature also has a bass contour knob (3) to let you increase or roll off some bottom-end, if things sound too thin or woolly. The Reverend Billy Corgan Signature is available in 4 satin finishes – Metallic Alpine, Purple Burst, Silver Burst and Pearl White. The guys went for the latter, choosing the more understated aesthetic. When James Iha was Corgan’s right-hand man in The Smashing Pumpkins, his main guitar was a late 80s Gibson Les Paul Custom in Ebony, with no modifications. He also used a handful of other instruments, such as a Gibson Flying V in Cherry Red (used during the Mellon Collie and the Infinite Sadness era), SGs and even a vintage Teisco K2L (as seen in the music video for Rocket). Rabea and Matt however went with the obvious choice, choosing an Epiphone Les Paul Custom Pro. Although not exactly like Iha’s trusted main guitar, most notably being much cheaper than its Gibson counterpart, this instrument gets close enough at around £500. With a full Mahogany construction and dual humbuckers, the iconic Les Paul has always been a staple for rock music. The Epiphone Les Paul Custom Pro however has a few added refinements, such as coil taps for each pickup so that you can get single-coil tones too. Although Iha’s Gibson didn’t have these electronics, you can use them to great effect for clean sections of Pumpkin’s songs like Today and Soma. Speaking of the pickups, the Custom Pro is loaded with a pair of Epiphone ProBuckers, deriving from the Gibson BurstBucker design. Inspired by 50s PAFs, these medium-output pickups may not have the intensity of the RailHammers in the Reverend, however they are still very versatile and can deal with all of the fuzzy gain you can throw at them. The Smashing Pumpkins used Marshall amps and cabinets almost exclusively in the early to mid-90s. JCM800s were used heavily by both Corgan and Iha when recording Gish and Siamese Dream, using its famously crunchy-sounding distortion for rhythm tracks on their debut in particular. The amp was however modified with KT88 tubes, which according to Corgan, transformed the sound of the amp and gave him exactly the gain he wanted. In order to attain the fuzz sound on Siamese Dream, Corgan would plug his Electro Harmonix Big Muff pedal into the ‘low gain’ input of the JCM800 with the Master Volume cranked, and then use the Preamp Volume to find the optimal “sweet spot”. Corgan and Iha later used the Marshall JMP1 Rack-Mounted Preamp and 9200 Power Amp live on the Siamese Dream tour cycle, and avoided employing the use of their Big Muff pedals due to noise and feedback issues onstage. This pairing however still gave them a huge sound, and for the recording sessions of Mellon Collie and the Infinite Sadness, Corgan even integrated a Mesa Boogie Strategy 500 Power Amp into his rig. This helped him craft the super-saturated distortion tone heard prominently in tracks like Jellybelly and Bullet With Butterfly Wings. 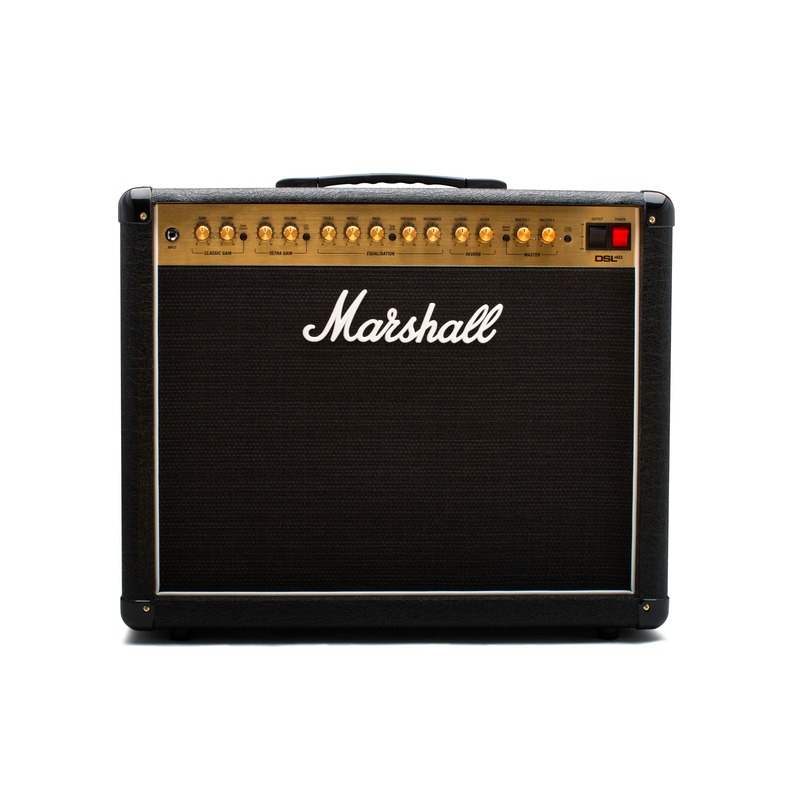 It therefore made plenty of sense for Rabea and Matt to pick out the popular Marshall DSL40C for this edition of Sound Like. With a full valve-driven design, this amplifier can get close to the sound of a JCM800 but for a fraction of the price. This combo has been a favoured choice in the Sound Like series on Andertons TV, but that’s because when it comes to budget valve amps, there’s not much better! This 40W 1×12 combo may not have the biggest amount of headroom in the world, but its focused low-end and slightly compressed quality serves as the perfect tonal foundation for the lairy-sounding Big Muff. Taming the pedal’s abundance of low-end woolliness, you can expect a consistent and slightly more controlled tone from the fuzz when plugged into a Marshall. Without the fuzz pedal in front of it, the clean channel is very balanced-sounding, not brash or piercing like a Fender-style amp when turned up loud. The Overdrive channel has that signature Marshall crunch and saturation, not far off the sound of a classic JCM800, which Rabea demonstrates in the excerpt for I Am One. The Smashing Pumpkins have used a raft of pedals in the studio over the years, but of course the most renowned ingredient of their iconic tone is the Electro Harmonix Big Muff pedal. Using it to pioneer the huge, engulfing “wall of fuzz” sound that defined Siamese Dream, Corgan relied on a particular iteration of the circuit to attain that massive sound – the late 70s V4 ‘Op Amp’ version. With originals of that particular circuit selling for hundreds of pounds on second-hand websites, in late 2017 Electro Harmonix unveiled the Big Muff Op Amp pedal. Designed in collaboration with Corgan himself, this pedal essentially gives you the Siamese sound in a compact stompbox. It is worth noting however that Corgan and Iha would not conventionally double-track their rhythm parts on Siamese Dream, but would actually record the same section 4 – 6 times in order to achieve the super-thick, layered effect. This is obviously difficult to replicate by yourself, however if you have a recording setup at home you can certainly give it a try! The Smashing Pumpkins are also regarded for their extensive use of modulation effects, particularly phaser. Using a variety of different phasers on Siamese Dream, including vintage MuTron Bi-Phase and Electro Harmonix PolyPhase units, Corgan would famously use the MXR Phase 90 (and 100) pedal for lead guitar parts. But rather than use it traditionally, he would turn the speed/rate all the way down, just to give his solos some subtle movement and to create an almost artificial doubling effect. The solo in Cherub Rock is a great example of this. Corgan would also employ the use of an MXR Distortion+ for his lead sounds, running the pedal into the Big Muff to achieve a super-smooth high-gain tone with more mid-range cut. Another perfect example of this lead tone can be heard in songs such as Rocket and Hummer. What Pedals Did Rabea & Matt Choose? As the Electro Harmonix Op Amp pedal hadn’t been released at the time of filming, Rabea and Matt found the closest fuzz boxes they could get. Choosing a standard Big Muff Pi each, these highly-identifiable fuzzes can get you very near to the original tones from Siamese Dream, featuring the same basic circuitry and set of controls. Rabea also opted for a Way Huge Russian Pickle too, a pedal that derives heavily from the Sovtek Russian Big Muff fuzz boxes. With less top-end and more boomy lows, this pedal can get fairly close to the signature Pumpkins tone, but the standard Big Muff Pi is still far more authentic-sounding. To cover modulation, the guys chose the Electro Harmonix Nano Small Stone. Similar in terms of functionality to an MXR Phase 90 with its single Rate control, the Small Stone also has a Colour switch to let you adjust the tone and nature of the phasing effect, giving you some extra versatility. Matt uses the Nano Small Stone at the beginning of the Cherub Rock clip, but you can use it well for songs such as Mayonnaise too. Do you think Rabea & Matt got close to the Smashing Pumpkins sound? Leave a comment below and share your thoughts! Matt: Hi guys, I’m Matt! Matt: And this is Sound Like on Andertons TV! Matt: Sehr loud, sehr loud. Matt: Smashing, yes, my ears feel like pumpkins. Rabea: If I was a pumpkin I’d like to get smashed. Matt: Smashing Pumpkins, you’ve requested it. Matt: Yeah, and still big today. Rabea: -so he was really excited to know we were going to be doing this one today. Matt: Yes, so we’re gonna attempt in our greatest wisdom to get some gear together, and sound like Billy Corgan *slash* Smashing Pumpkins, and on that note we’ll see you later. Matt: Yes, as some of you may know Billy Corgan has a signature Reverend, which is this, I always think it looks a bit like, not, maybe Iron Man or some kind of superhero thing with these little panel things going on. Matt: It is very cool. Rabea: -and this is actually, well, it’s listed here as £899 but it’s on a cheeky sale down at £749. Rabea: And there’s a few available, so if you do like the look of this guitar and hopefully the way it sounds when we plug it in later, then check it out. RailHammer pickups. Matt: Yes, his signature pair. Rabea: The cool thing about the RailHammer stuff and also a lot of the Reverend stuff is in the circuitry, they have this kind of low-end boost. I’m not quite sure yet, I’ll find out the special circuitry inside this guitar, but yeah, this is the one if we want it to get closer to Billy Corgan. Matt: I don’t think we can go anywhere else. Rabea: Billy Corgan uses the JMP1 rack preamp. Matt: -lots and lots of different gear. Rabea: -we’ve seen him with Diezels, Voxes, old-school Fenders. Matt: Yeah, loads of stuff, so. Matt: -will come into play. Matt: This might be the final time we ever, ever, ever use the DSL40. Rabea: Well you never know? Rabea: -who knows. But it’s down at, what, how much is it now? Rabea: -and we’ll see what else. Matt: -and maybe something else, but we’ve got £250 left for Billy Corgan. Rabea: Let’s go and see what pedals we can get. Rabea: So, you know, like there’s still a bit of money left in our budget, and I think it is worth getting another fuzz to put on top. Matt: -so which bits we need. Rabea: But I think it’s really important that we get that fuzzy, distortion tone. Matt: So whether something MXR might work, or whether we just take a bit of a punt. Rabea: I think we punt it. Rabea: So Matt has very kindly grabbed the Big Muff Pi. Matt: Yes, in its box. Rabea: -another fuzz pedal probably to stack on top, so we’re gonna have a look around and then go to the video room. See you there! Rabea: We’re back in the video room. Matt: Yes we are indeed, in this day’s fine video of sounding like The Smashing Pumpkins. Rabea: This is the last video of the day. Matt: Last one of the day, so words may be mumbled *mumbles words*. Rabea: Exactly! And on that note, what we’re gonna be doing is taking you through the gear that we’ve picked to sound like Billy Corgan of Smashing Pumpkins, but before we do that it’s worth pointing out what you’re doing. Matt: It’s worth pointing out that I’m actually trying to sound like James Iha of The Smashing Pumpkins as well. As they’re a two guitar band, the focus is really on Billy Corgan, but yes, bit of context. Rabea: This is the guitar that I am using and this is, in fairness to it, a really cool guitar. This is the Reverend Billy Corgan signature guitar, it’s got his signature RailHammer pickups in it and it’s got, essentially you’ve got a three-way toggle, volume, tone and then you’ve got like a bass boost that you can dial in and out as much as you want. So it really is quite awesome, and it drives an amp in a really nice way. Rabea: It does. Has locking tuners, maple neck, and to be fair, it plays great and it sounds wicked. 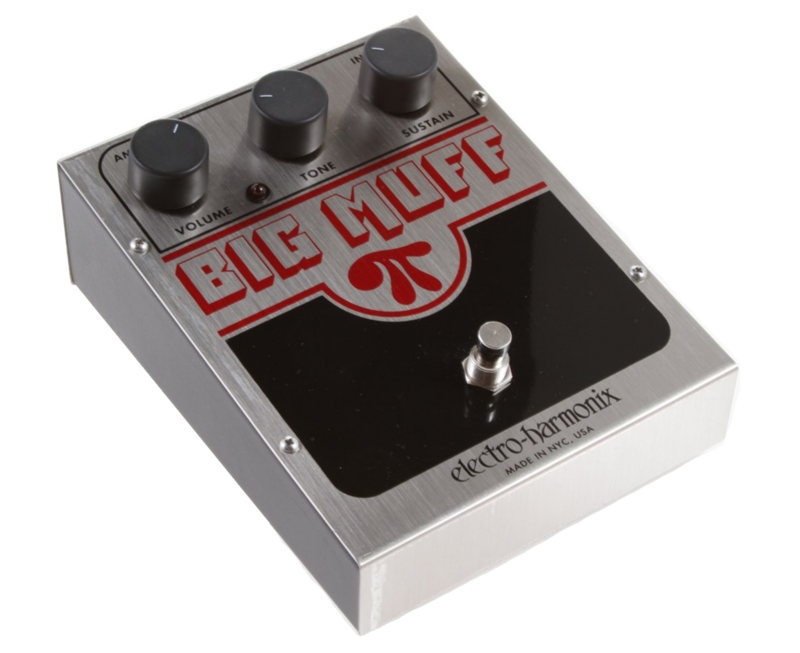 Rabea: I’m going straight into the Electro Harmonix Big Muff. It’s the standard Big Muff that everybody knows and loves; he was famous for using that and to be fair to it, it’s awesome. It really does the job. But then actually we said we were going to stack another fuzz on top because that’s also what Billy Corgan is famous for doing, so we found the Way Huge Russian Pickle fuzz and in fairness to that, it’s a killer sounding fuzz. Providing the volume, the Marshall DSL40C, and we’re running it on the classic gain and I’ve got the crunch, I do have the crunch in, and I’ve sort of been riding it depending on what song we’re doing. So, before we get into Matt’s rig I really, quickly just show you the tones. This is what it sounds like. Rabea: It’s worth been pointing out that although there’s quite a bit of reverb in there, I’m running the gain at three quarters. Again, the crunch is in, so that’s how we’re getting that sound. But what I can also do is throw in the bass boost, check this out. Matt: He’s not a shred guy. Rabea: -no he’s not, so we shouldn’t focus on that. Matt: But, that is a great feature though, I’m not entirely sure what it’s doing but it sounds, I don’t know if it comes over on the mic either, but it sounds huger. Rabea: -like a boost, but like, again. Matt: It’s like a clean boost really. Rabea: So that’s the Big Muff in. Rabea: Which sounds great. I’ll just quickly swap over to the Russian Pickle. Matt: That’s a great sound. Rabea: It sounds wicked, way more mid-y isn’t it? Matt: Did you use both of them together? Rabea: I had them both on at the same time yeah. So, this is with them both on. Rabea: I mean it’s a great sound. Rabea: And again coming from this. Rabea: -it does sound grungy. Matt: But it’s massive, especially with two guitars, it’s just like a full-on sound. I’d like to see an octave thrown into that rig. Rabea: Yeah it would. Octave and fuzz is the one. Matt: Think we might have to do it. Rabea: We will. But until then, Matthew. Rabea: I love those guitars. Matt: -obviously the Epiphone version. Yeah, this is only about £500, and this actually really usefully had a bit of a coil-splitting function, which I used quite a lot to emulate some of the more Strat-y sounds. Matt: Apparently it was a Big Muff as well, so there you go, and then I’m running this into the Fender Hot Rod Deluxe, which is a beautiful amp. Rabea: -it’s now even more affordable than it was originally. Matt: I mean I think it crept up to £600 didn’t it? Rabea: Yeah, it was around that. Matt: Or maybe even more. Rabea: So you get a nice chod off that, off that price-point and I think to be fair, the rig in itself - two fuzzes, this particular guitar, which you don’t necessarily have to get but you could get a Reverend, they do RailHammer pickup-loaded other Reverend guitars. But yeah, the whole thing just sounds monstrous. Matt: -aside from this rig, so that’s just a little thing there. Rabea: And on that note, it’s probably worth pointing out that, that is how you sound like Smashing Pumpkins hopefully, but you will be the judge. Matt: Yes, let us know what you think, let us know how you think we did. As usual, all the links to all the gear is in the description box below. Rabea: And comment in the comments section below about what you thought. Matt: And if there’s anyone you’d like to see us sound like next. Rabea: And on that note, I’ve been Rabea. Matt: And on that note, I have been Matt. Rabea: And this has been Sound Like on Andertons TV. Matt: And on that note, goodbye. Pete: And on that note, how many times have you said that? Matt: And on that note, shut up.